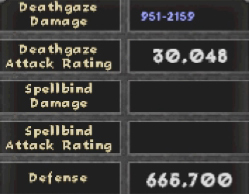 This build was created to push the limits of passives and oskills. Then came Big McLargeHuge maximum swag potential. At the very least, it is a fun way to explore Sigma and set up for farming. 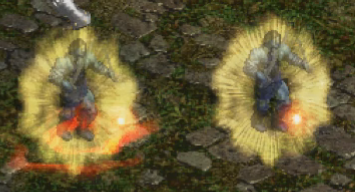 In the spirit of modding, this all started from a "What if..."
Big stats, summons, and flashy reanimates. War Spirit reanimates provide a lot of variation. Elites are strong. The Spear tree passive works without a spear. Ha! Potions are the main source of healing, although leech helps. Not the hugest damage all the time. Takedown (1) - Prereq. Too short of a duration to be of use. Hyena Strike (several) - Boosts the max level of Lioness. Great Hunt (1) - Prereq. Good even with 1 point if you were curious. Lioness (SMax) - Giagantor numbers. Maxed at +40 for me usually. Pounce (1) - I miss the old OP Assassin pounce builds. Better as an oskill. Wild and Free (10) - 30% movement speed is a happy medium. Summon Fire Elementals (1-Max) - Great early/mid game tanks. Balance (Max) - Flat defense combines well with percent defense. Ecstatic Frenzy (1) - Prereq. Defensive Harmony (3) - Bosses are capped at 25% slow. Bloodlust (Innate) - Items on swap can boost this to +350% physical damage. Spellbind (1-Max) - Less damage in, more damage out. Further points are mainly useful for their synergy. War Spirit (1) - I haven't noticed a difference between 1 and max points. Spirit of Vengeance (Max) - Reanimates are a good source of damage/tanks/auras/etc. Not all Spirits are created equal. Resummon as necessary. Deathgaze and Noctule are great oskills from TUs. 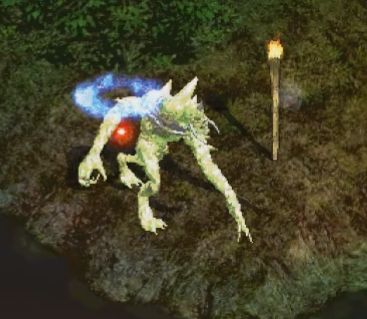 Charged Strike can be found on amulets (ilvl +82). Crucify and Parasite can be worthwhile oskills from SUs. Level 1: vendor your favorite weapon, some 15% speed boots, 1-socket staff/belt/gloves. This game's already better than Diablo III. MOs: Use %ManaRegen orbs to counteract +Skills costs. Save room for +Attributes if needed. Otherwise, save gold for oils. ** Save Imbues for Sacred items at level 99 crafts (details later). ** You can put +1 skill point into every skills until Lioness is unlocked, then respec for a better super-early game experience. ** Note the Cube Recipes for socketables, disenchanting/uptiering, and changing item quality. I generally wait until T2/T3 for crafting uniques or gamble if one doesn't drop. to stretch its durability, use a jewel with Indestructible (ilvl 16-99), or simply reroll it. Killspeed was not an issue for me, but mana usage was so I held off on this for a while. ** Most of this won't matter much if you're multiplayer. Amulet: A rare with Charged Strike is what inspired this build. Try it out if you find one! Sockets: Lem-crafted jewels to replace Tals. Resistance Pgems are always nice. MOs: %ManaRegen, %/+Defense, Attributes, Resistances are all good. For the weapon, use all damage MOs. will eventually get replaced by Jitan's Gate. ** For runeword bases: Use oils of renewal/luck to roll perfect superior base items, then use MOs to apply the max %ED, then roll the runeword. for crucify was nice, too. Sockets: Lum-crafted %Experience jewels (ilvl+90), %speed jewels, Jah runes, and Thai runes are all good. Mystic Orbs: %ManaRegen and +Defense are good. Extra slots can go to elemental damage, resistances, or stats. Quest-cleared boss portals can be used to grab the waypoint and save time. Joining popular lobbies can be a nice exp boost. Mind your manners. Act1 games are a great way to party and clear most/all of the current difficulty. Let classes have their respective gear - y'all earned it together. Well-placed town portals are invaluable. If everyone dropped one at the zone/floor entrance and end (or corpses), we'd all save a lot of time. 105: The Butcher: Rush towards him so he targets you first to avoid having your summons roasted. Easier than Grizwold. 105: Infernal Machine: Lock on and keep swinging. Most mobs will die to AOE, some might require special attention. 105: Death Projector: Unsummon everything. Unfortunately we cannot cheese this with a +Hailstorm ammy. 105: Island of the Sunless Sea: Reanimates help. Rush the angels on sight like the Butcher. The last tele is tough and is avoidable by re-running for the 6th bag. 110: Lord Aldric Jitan: Pulling a few at a time and letting towers expire will make this doable. 110: Horazon's Sanctum: Damage check. 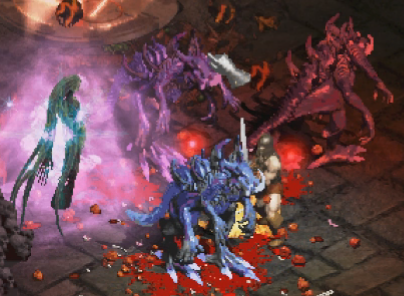 110: The Binding of Baal: Be selective about engagements, fight mobs that are distracted. 110: Assault on Mount Arreat: Same as above. Engagement well, run around as needed. 110: Cows: Keep a few summons up. Tanky reanimates make a huge difference. Good for leveling. 115: Bull Prince Rodeo: Get stunlocked and die a lot. Chip away and rip. 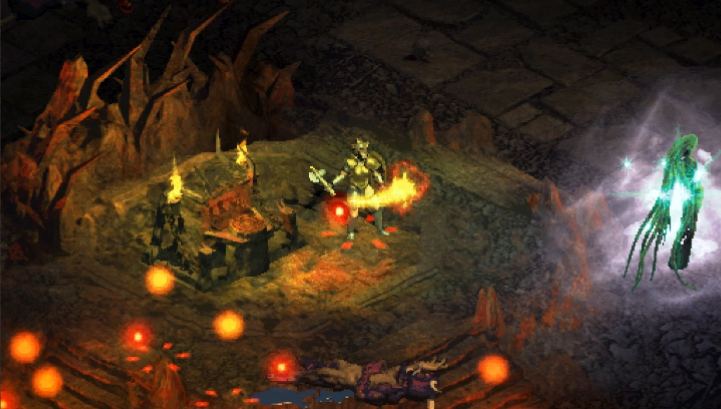 115: Rathma Square: Manage the respawning minions, then lock on. AOE will take care of the rest. 115: Akarat: Damage check. This is what made me opt for Deathgaze. 115: Black Road: Summons target the alter, which removes most of the difficulty here. 115: Kurast 3000: Despite there being nothing too special, this is still one of my favorite areas. 115: High Heavens: Kill the first mob at a choke for safety, the free debuff chains well. 115: Tran Athulua: Only bite off what you can chew. Avoid the numerous death procs. 115: Legacy of Blood: Get lucky. Use summons to tank hits. 115: The Veiled Prophet: Wait out the lollazers, nuke the rest. 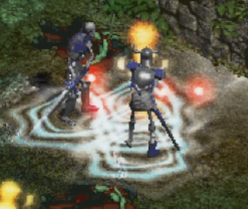 115: Heart of Sin: Distract with summons to avoid damage. I died a lot here but that tip gives me a chance. rip. 120: The Triune: I died a lot learning this fight - it's tricky. 120: Teganze: Stacking resistances helps. 120: Duncraig: Make safe teleports, avoid barrels. This is how far I am currently. 120: Baal: Yeah, he's pretty strong. Huge props to Laz and Marco for carrying the torch. 11/10 mod. aerial for the great TLDR Guide. ChuckNoRis for the great Miniguides Guide. terryys for the speed calc Speed Calc. rumblealex and Elixir of Adrenaline for answering my random question that one time. Writing this has made me want to play more. Looks like an interesting/fun little ama build! Might give this a try. looks like it needs some more work so far . you may add some more vids of harder ubers , at least some duncraig/fauztinville farm samples (i don't think dethgaze is the way to go in end game . the base damage from the TU Brainhack is quite low compared to other options) . i play a similar build (maxing lioness) but i went for 2h (meme zon) with Iron Spiral from Hellreaper, got some vids here if you want to take a look : https://www.twitch.tv/videos/394558011 https://www.twitch.tv/videos/395045393 . my end game gearing is orientated on Charged Strike oskill (besides the amulet , you can get it from 3 more SU's for extra targets). it goes great with either Danmaku or Hammerfall shields if you want to use 1h + a more expensive shield . i want to try it with Gotterdamerung on as soon as i get more charms to gain enough str to wear it . my build just hit 120 .
you may also consider Battlemaiden + Skin of Kabraxis combo as togather they provide a shitload of EWD . I’ve made an Ancient’s hand COTW/Lioness shield build with Danmaku, full charms, Shark RW, and pretty much every BiS item you can think of a few seasons ago. It had high defense but the LL faltered Paragon gems drastically diminished the LL I received from jewels. Unfortunately, the damage and survivability ended up being far worse than if you had just rolled a barb/paladin with far less expensive gear. Also, your guide lists pretty mediocre TU4’s as “end-game-viable” which I think is a little misleading. I do like the intention, though. This is exactly the playstyle I was hoping for when I made my “memezon” but, as the name would indicate, it was nothing more than a meme. One last thing: If you think “Griswold” is a tough boss, you’re in for a treat, friendo.